In my neverending quest to keep my hands moisturized throughout the current harsh conditions, I was sincerely thrilled to come across Kai's table at the Henri Bendel Beauty Breakfast last week. Already a huge fan of the line -- their candles are super-calming and their Perfume Oil is to die for -- I was definitely excited when they presented me with their Kai Body Butter. Formulated with shea butter, safflower seed extract, apricot kernel oil, cucumber, chamomile flower extract, aloe leaf extract and a blend of Vitamins A, C and E, this is a true whipped delight for the skin! Immediately upon applying, the lotion soaked into my skin and left it glossy, smooth and most definitely less cracked and dry than it had been moments before. And as an added delight for the senses, the body butter is scented with the original Kai Perfume Oil, creating an intoxicating floral aroma that blooms right out of the tub and into your skin. Named as one of Oprah's Favorite Things for 2007, this body butter truly delivers. 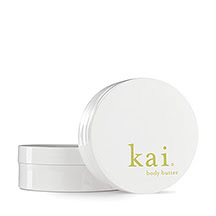 You simply must try it for yourself -- Kai Body Butter is $55. Trust me -- dry, rough skin will be a thing of the past!